Today in Masonic History Andrew Jackson passes away in 1845. Andrew Jackson was an American politician, lawyer and 7th President of the United States. It is unclear where Jackson was born. His mother was on a trip at the time Jackson was born. Jackson's father had passed away due to an accident shortly before Jackson's birth. What is known that Jackson was born in the area of the North Carolina and South Carolina border prior to the land being surveyed. He was born on March 15th, 1767. During the American Revolutionary War, Jackson's family were strong supporters of Independence from British rule. Jackson worked as courier for the local militia and along with his brother were captured by the British. Jackson and his brother were extremely mistreated during the captivity. They were starved and at one point, Jackson refused to clean the boots of a British officer. The officer slashed at him with a sword and was left with scars on his left hand and head. After they were released, Jackson's brother died within a few days. Jackson's mother volunteered to care for prisoners on a ship in Charleston harbor. There was a cholera outbreak on the ship and Jackson's mother contracted the disease and passed away. By the age of 14, Jackson was an orphan and had lost his entire family. He blamed the British for his losses. By 1787, Jackson had taught school, worked for a saddle maker and studied law. It was in 1787 that he would pass the bar. He would move to an area that would be called the Southwest Territory of South Carolina, the region that would one day be the state of Tennessee. Jackson began his legal practice in Jonesborough, what is now Northwestern Tennessee. Jackson's legal education was scant at best. It was enough education though to allow him to practice frontier law, which consisted of land disputes. In 1794, Jackson began speculating in land in and around what would be Tennessee. In 1796, Tennessee would become a state and Jackson would be the first Representative to the United States House of Representatives. The following year Jackson would be elected to the United States Senate, he would resign with a year from the position. In 1798 he would be appointed as a Judge on the Tennessee Supreme Court and he would serve until 1804. Jackson would also become a planter in Tennessee. He would eventually own a plantation of 1,050 acres. Jackson grew cotton and used slaves to work the land. By the standards of the time Jackson was considered a humane slave owner. In 1801, Jackson was appointed as the Commander of the Tennessee Militia. He would later be elected Major General of the Tennessee militia. When the War of 1812 broke out, Jackson was still in command of the Tennessee militia. During the war "Red Stick" Creek Indians sided with the British. Jackson along with the Tennessee Militia, Cherokee, Choctaw and Lower Creek warriors were able to defeat the Red Stick. Sam Houston and David Crockett were also among the men who served under Jackson at that time. After the Red Stick were defeated, President Madison ordered his Secretary of War to make a treaty with the "Red Stick" Creek. Jackson wanted to see them totally defeated and driven out. 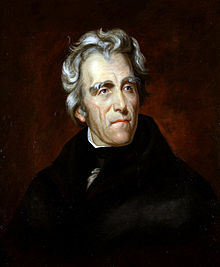 When Jackson was promoted to Major General he was in a position to through out the treaty and replaced it with a much more harsh treaty, that would eventually be signed the Creek Indians. Although the British and the remaining Red Stick warriors who fought against the United States would not recognize the treaty until after the war. The Creek Campaign would gain Jackson one of his two nicknames that came from the War of 1812. The Creek began calling Jackson Jacksa Chula Harjo "Jackson, old and fierce". In 1814, the Battle of New Orleans occurred. The Battle of New Orleans was a major battle in the War of 1812 and would cement Jackson in the minds of many Americans. During the Battle of New Orleans, Jackson had assumed command of the region. The battle broke down to 5,000 soldiers on the American side and 7,500 soldiers on the British side. By the end of the battle, the British would have more than 2,000 casualties as opposed to the 71 casualties on the American side. Jackson was a strict and popular commander. His men referred to him on the battlefield as "tough as Old Hickory". Gaining him his second nickname, "Old Hickory" a nickname that would stay with him the rest of his life. In 1822, Jackson was nominated by the Tennessee Legislature for President in the 1824 election. In the election there were 4 candidates. Due to some states not being able to vote, the popular vote went to Jackson and the electoral college votes were equally split over the four candidates that there was no clear winner. This left the election in the hands of the House of Representatives. In what was termed the "corrupt bargain" Adams was chosen by the house after, Henry Clay put his states support behind Adams. Many Jackson supporters felt that Jackson had been cheated out of his due. In the election of 1828, Jackson was again nominated. This time Jackson would win the election. Because of the events that had been happening in the country involving the Morgan Affair, Jackson, being a well known Freemason, saw his election as a mandate from the American People. Jackson would serve as president until 1837. Jackson would retire to his plantation, Hermitage, after leaving office. He would pass away there on June 8th, 1845 from tuberculosis, dropsy and heart failure. Jackson was initiated into Harmony Lodge No. 1 in Tennessee. He would be instrumental in founding other lodges in the state. He was the only President to have been a Grand Master of the state until Harry S. Truman in 1945.